We’re only 3 miles into the 35-mile ride when we hit our first 18-percent climb. It’s short and punchy, and soon mercifully easing back to a more doable gradient; but, beside me, I hear my dad’s breathing quicken. It’s 38 degrees Fahrenheit and raining on this mid-April morning in northern Vermont as I glance over at him, wondering if I should have asked him to join me on a different, less grueling gravel ride. My dad lives in western Pennsylvania, all rolling fields and picturesque Amish farms. Those roads are ideal for skinny-tired riding—with the exception of the channels carved out by horse-and-buggies. But they look nothing like this. To be fair, not many roads do. 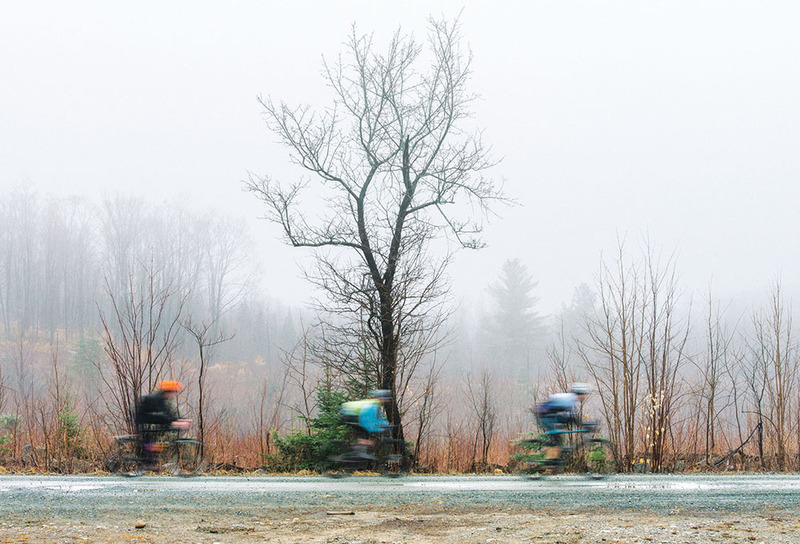 We’re just 30 miles south of the Canadian border in East Burke, Vermont, and the roads dance their own jig up and down the ridges that make this a top mountain-biking destination. The 100-plus miles of buffedout single track of Kingdom Trails are closed right now, so it’s nothing but mud and rain today—and we suffer accordingly. That’s kind of the whole point though. 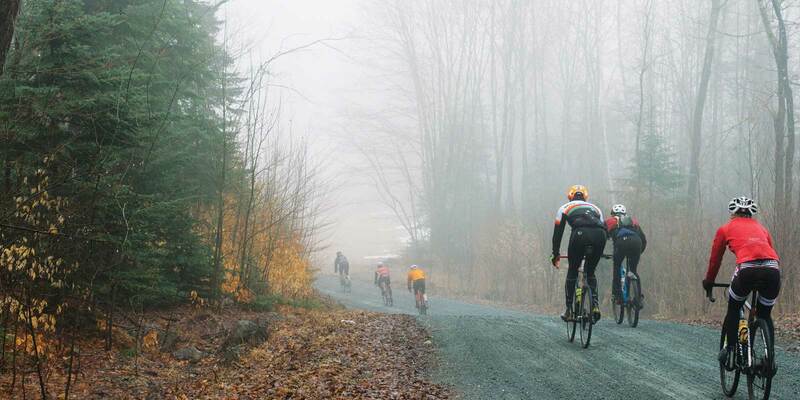 We are riding through misty rain in the Rasputitsa Spring Classic, a mud-fest with 4,000 feet of elevation gain that loops out and around Burke Mountain on mostly dirt roads. 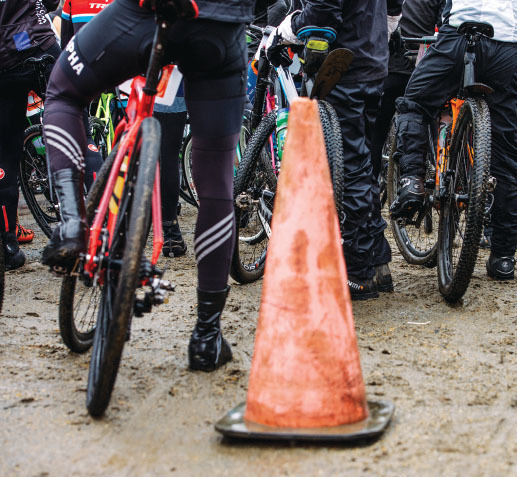 The highlight—or lowlight, depending on who you ask—is a 5-kilometer section called Cyberia that ratchets up to an unforgiving 23-percent grade as it ascends 1,140 feet via a rutted track. Last year, unseasonably warm temps made Cyberia mostly rideable; this year, I expect snow, ice, mud and rain. I bet the race directors are delighted. 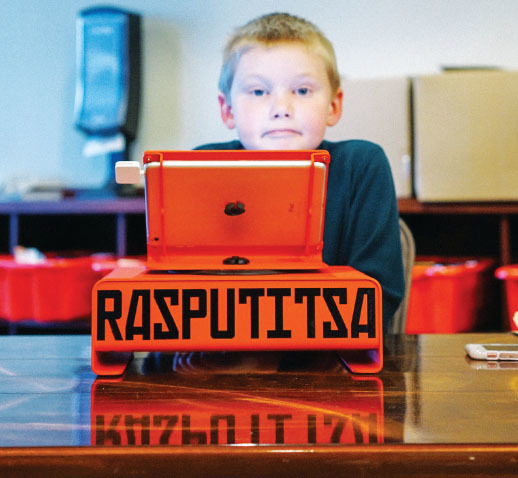 Rasputitsa is Russian for “sea of mud”—or mud season, as Vermont locals refer to the months when spring snowmelt turns the roads into tire-sucking, potholed rivers of sludge. 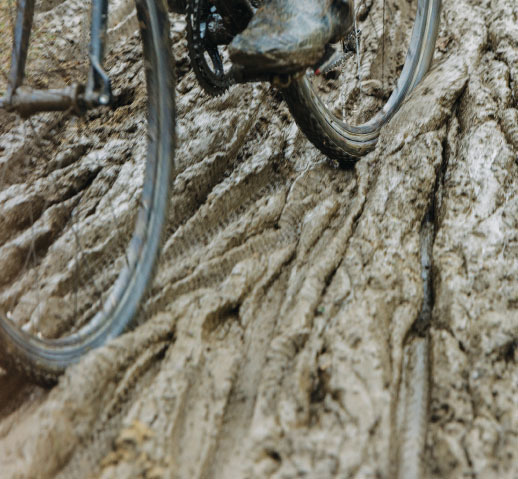 Mud has been known to engulf cars up to their fenders here; all bets are off if you’re trying to ride a bike through it. And then, of course, there’s the unpredictable spring weather. Fittingly, the entire event is tinted red with a stoic, Cold War-style theme, from the race marketing to the race poster of Putin and Trump kissing, to the Soviet-themed kit for sale. It’s a catchy idea, but in its own right the region is steeped in Soviet history, because nearby East Mountain was the site of a U.S. Air Force radar base from 1956 to 1963. Nearly 200 men spent those seven years scanning the skies and listening for the first whine of incoming Soviet planes. 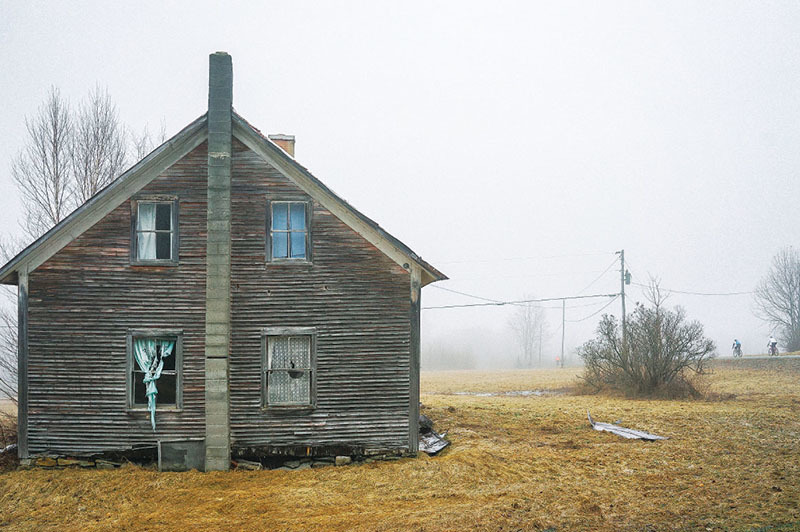 And the legacy of that closed base lingers—particularly along these cold, lonely roads. LINDSAY WARNNER AND HER DAD ATOP THE CYBERIA CLIMB. This is where my dad has come to ride Rasputitsa, specifically to suffer with me. He wasn’t supposed to be here, because my tales of the 2016 ride—sun, bikes, beer, friends—originally tempted my then husband. But our six-year marriage ended in February after I’d been riding solo for a couple of years. I’d thrown myself into bike racing, savoring the occasional podiums and falling into bed exhausted at night. But I kept the details of my crumbling marriage to myself. Finally opening up was a relief for me, but I could see the pain it caused my parents. So when it became clear that my ex wouldn’t be using his Rasputitsa registration, I invited Dad. And then asked Mom if she wanted to volunteer. So when we get to the turn that marks the start of Cyberia, Mom is standing on the corner, marshalling cyclists into this Vermont cave of pain. See, it’s bad enough to have sustained 18-plus-percent climbs—but Cyberia is also what Vermonters refer to as a Class IV road. That’s shorthand for “unmaintained during winter months.” For us, that means “mostly unrideable.” So I’m not surprised when, after Mom’s quick hug and enthusiastic cheering, Dad and I turn the corner to see Cyberia covered in snow, ice and mud. I know it will leave us crouched over, pushing our bikes. 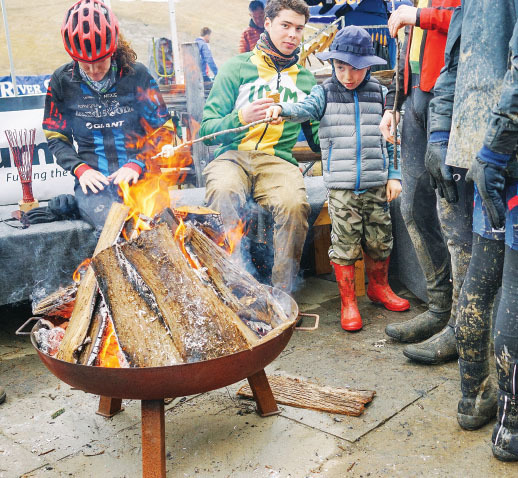 We give it our best, but since I haven’t swapped out my gears since the end of cyclocross season and Dad is demo-ing a ’cross bike from Louis Garneau with similarly racy gearing, we soon fall victim to the knobby-tired fat bikes around us. We’re already walking when the grade rockets sharply upward. And all around us, comrades start to fall. United by the unrideable conditions, we settle into the rhythm of sidestepping snowy slush piles, tiptoeing around icy patches and pushing evermore uphill. Near the top, we start hearing music. I grin to myself and glance over at Dad. “Almost there!” I say. Dad responds with something along the lines of “Why are we doing this again?” But I can tell it’s a mostly rhetorical question, because he’s grinning a little bit too. Around this time, mythical woodland creatures start popping out of the woods. I recognize the unicorn mask and the Narnia-esque faun from last year, but I’m amused to see a trio of devils—complete with tridents and horns—heckling and chasing riders up the last few steps to the top. There’s even a guy sporting head-to-toe leopard spots and cat ears. The encouragement is appreciated—as are the maple-syrup shots at the top, served up in frozen shot glasses. Still, as we point our handlebars downward, I’m grateful that the biggest climb of the day is out of the way. But climbing on a chilly, rainy day does keep you warm. By the time Dad and I have stopped for a picture, quaffed a shot of maple and started down the other side, I’m getting cold again. And being cold makes me do dumb things. Such as trying to descend quickly down a rutted, frozen Class IV road. Bad idea! Now, I have a gritty, frozen-mud patch running from left knee to hipbone—plus two wet gloves—and it is seriously cold. I should have taken my cue from Dad, who descends, well, like a 66-year-old dad. And guess what? He’s warm. And mostly dry. Which serves him well as we hit the only flat section of the course, which seems to last forever as the wind whips rain into my frozen face. The last hill of the day, Victory Road, is a warm-up to the final injustice: a cyclocross course up and around the muddy ski hill near Sherburne base lodge. 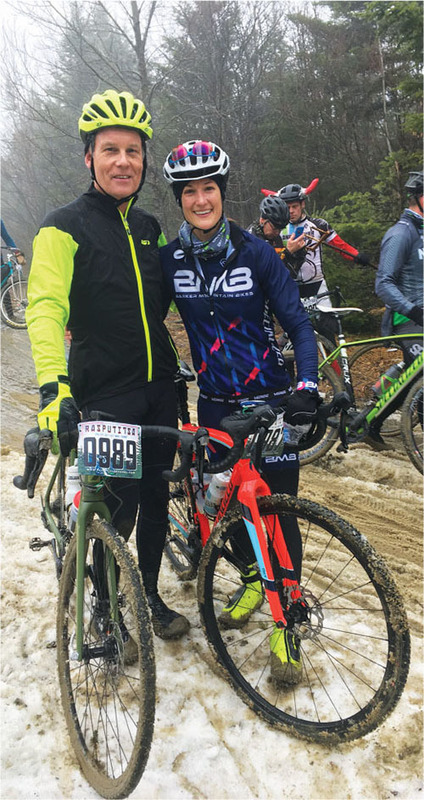 There are stairs, barriers and plenty of opportunities for hecklers to ply their trade—but what I remember best is hearing Mom cheering Dad and me across the finish line. 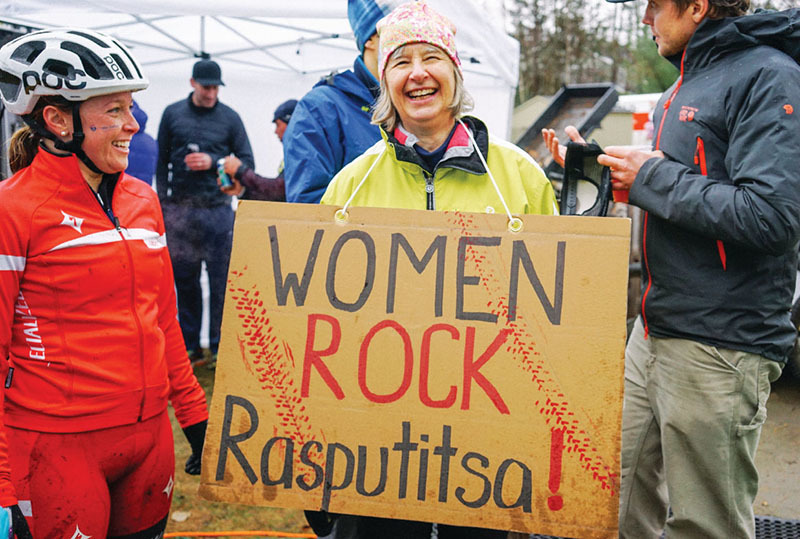 Muddy, cold and ready to get out of my wet kit, I’ve earned this Rasputitsa finish. So have my dad and mom—who stood in the rain marshalling for hours. “Sure!” he shoots right back at me. I’m impressed. But I also know I got my stubborn streak from somewhere. And, right now, I’ve got dry clothes—and a post-race feast and a beer with my parents to look forward to. And that feels like a pretty good metaphor for things to come. From issue 71. Buy it here.